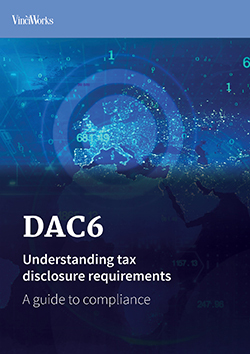 DAC6 is a new regulation that requires intermediaries to comply with mandatory transparency rules and hallmarks. Read the latest guidance on the Directive and get updates on our DAC6 training. DAC6: Will you need to report? As the August 2020 reporting deadline approaches, we’re seeing varying degrees of awareness and compliance among firms and intermediaries. Since most cross-border arrangements have potential tax implications, how are you assessing which ones will require reporting? Are you proactively documenting every single cross-border deal just to be safe? Some firms are requiring lawyers to indicate DAC6 relevant transactions when they open a case file. Others are wondering which deals are relevant, while some are just learning about the reporting requirements. VinciWorks has designed a DAC6 risk assessment to help intermediaries understand the risk exposure of their cross-border transactions. This entry was posted in DAC6, Tax Evasion, Thought leadership on 5th March 2019 by VinciWorks. On 25 May 2018, the Economic and Financial Affairs Council of the European Union (ECOFIN) adopted the 6th Directive on Administrative Cooperation (the “Directive”), requiring so-called tax intermediaries to report certain cross-border arrangements that contain at least one of the hallmarks as defined in the Directive. The new EU rules which aim to clamp down on aggressive tax planning are set to impose a huge compliance burden on taxpayers and their advisers, potentially even in circumstances where there is no tax benefit at all. VinciWorks has published a guide to help businesses better understand DAC6.